Bali is a fantastic tropical Paradise. You can go to Kuta Beach or Legian for a great night life. 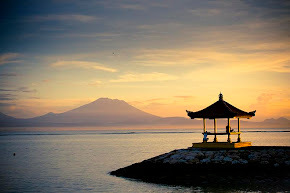 Why not travel o ver to the island escape of Nusa Lembongan and get away from the hectic lifestyle of Kuta and Legian? Fewer than 4000 people are fortunate enough to call Nusa Lembongan home. This small island, just 20km off the east coast of Bali, survives on the proceeds of fishing and seaweed farming.- the water is crystal clear which makes for excellent diving and snorkelling, and with fewer visitors than the main areas of Bali, surfers can enjoy a less crowded surf at the breaks on Lembongan. The unspoilt and relaxed atmosphere of the island has been maintained and is the islands greatest asset. The protected island measures 4 x 3 kilometres, has good surf, crystal-clear waters for snorkelling and diving and is very relaxing. There is not much traffic, no big hotels or pollution. It has two villages, Desa Lembongan and Jungut Batu, the latter offering the island’s best accommodation and water sports. Surfers go there to enjoy reef breaks with names like Playground, Shipwreck and Lacerations. Are you ready for a real vacation in Bali? Bali is a genuine paradise. Let’s go to Bali for a real adventure.